For US$9 a day, workers toil in the bowels of a mine that once funded an empire. When the Spanish came to Cerro Rico (Rich Mountain) in the 16th century, they hoped to find gold. But the cone-shaped mountain looming over the city of Potosi and now riddled with makeshift tunnels and unstable shaft systems produced silver. “You could build a silver bridge from the mountain to Madrid from what was mined here,” said Freddy Suarez, a guide who takes visitors to see Cerro Rico. A century after the Spanish arrived, Potosi was one of the biggest cities in Latin America and the wealthiest in the world. The busy extraction of silver and other minerals also made it the largest site of physical exploitation in the world, right through the 17th century. “Vale un Potosi” (It is worth a Potosi) became a commonly used expression to describe vast wealth, after Quixote blurted it out in Cervantes’s Don Quixote. But the apparent wealth of Potosi, the highest city in the world at 4,090 metres, overlooked the human sacrifice that made it possible. Countless natives were taken into forced servitude to toil in the mines alongside African and Indian slaves, working in squalid and extremely dangerous conditions. 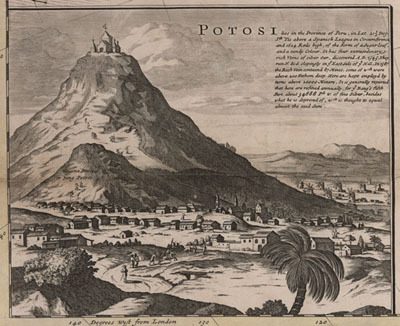 While records of fatalities were not kept, historians and geologists estimate that about eight million perished in Potosi during the Spanish colonial period, from 1546 to 1825. “Miners believe that their ghosts are still in the mines,” Mr Suarez said, adding that Cerro Rico’s nickname – The Mountain That Eats Men – is still used today. After coming out of Potosi’s cobbled, narrow streets, the road up to the mine is dotted with stalls selling cigarettes, dynamite, ammonia and soft drinks to tourists, all meant to be given as presents to the miners. Small treats, perhaps, given the lives these men lead. Working conditions in the mine are primitive: the air is unbearably hot and stuffy due to a lack of ventilation and is thick with dust generated from the blasting of rocks. The tunnels are poorly lit and narrow, restricting the workers’ movement. The only signs of modernity are the pneumatic drills that have replaced pick axes. Lung disease, mercury poisoning and exhaustion cause sickness and death among the miners, whose life expectancy is less than 40 years. And accidents, especially with dynamite and falls from unstable ladders, are still common. Mr Suarez took the tour group down two levels for shelter from the explosions. “We will wait here until we get the all clear,” he said, before a series of blasts shook the mine and dust rained down through the tunnels. In the lower levels, where adults cannot squeeze through, children wriggle in to extract rocks that may have silver or the less precious zinc. Working for 10 hours a day the miners chew coca leaves to suppress hunger and fear. A firm golf ball-sized wodge is formed in the mouth and typically lasts for a whole shift. No food is eaten in the mine as miners believe this would make them less alert. Women are prohibited except in tour groups. “There are 250 miners who work officially in here but 8,000 people work around the mine in analysing the output,” Mr Suarez said. “Miners get 65 bolivianos a day (Dh33) and work six days a week. However, there is nothing stopping miners freelancing and they get paid according to what they can carry out themselves in their own hands. Juan, Enrique and Miguel spend their shifts on level five, deep in the bowels of the mountain. They drill the holes then stuff them with dynamite. Working deep inside Cerro Rico has given rise to a dark sense of humour among those who spend their days there.